Tuesday night's elections might have focused on the local side of things, but many of the issues decided that day have national implications. And across various U.S. states, there seemed to be a common theme: Many of the victories were conservative, whether that meant Tea Party politicians or right-leaning policies. Tuesday's elections were great for conservatives, but many of the victories weren't so great for progress and equality. Equal rights and an end to discrimination lost in Houston, while thousands of Kentucky residents' health care coverage could be in jeopardy. And residents of Portland, Maine, voted against an initiative to raise the city's minimum wage to $15 an hour by 2017. While some of the conservative wins weren't too surprising — Ohio's just not ready to legalize weed — some of them are downright harmful. Houston voters, for example, rejected a measure to end discrimination, namely because it included measures that would improve LGBT rights. The Houston Equal Rights Ordinance (HERO), also known as Proposition 1, would have allowed for greater transgender rights in the city, including the right for people to use the bathroom of the gender they identify with. But conservatives protested the ordinance, using the slogan "No men in women's bathrooms." The proposition had gained national attention and garnered the support of President Obama and 2016 Democratic presidential candidate Hillary Clinton, but it didn't gain enough support among voters on Tuesday. Other notable conservative wins Tuesday include Republican Matt Bevin's victory in the Kentucky gubernatorial race. Bevin, a Tea Party-approved candidate, beat state Attorney General Jack Conway, a Democrat, for the governor's seat. The race was especially noteworthy because Bevin is only the state's second Republican governor in more than 40 years. 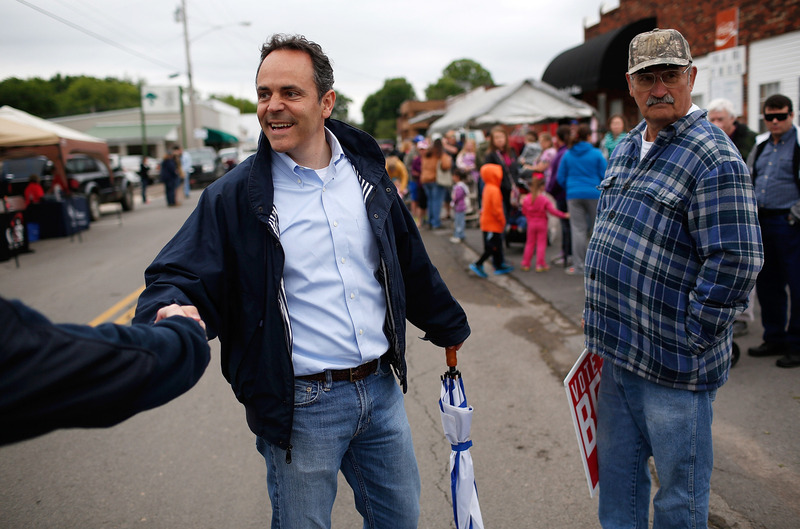 Bevin has big plans to advance a conservative agenda in the state, too — he's pledged to repeal Kynect, Kentucky's health care exchange, which could cause 400,000 state residents to lose their health care coverage, The Huffington Post reports. Kentucky wasn't the only state that saw a surprising GOP victory on Tuesday, either. Virginia's entire state senate was up for election on Tuesday, and the Republican party remained in control. Virginia Gov. Terry McAuliffe, a Democrat, had fought to gain a Democratic majority in the state senate — now, both of Virginia's chambers are in GOP control, which could make efforts like McAuliffe's push for stricter gun control legislation more difficult, The Washington Post notes. McAuliffe had called for greater restrictions on purchasing firearms after two journalists in Virginia were shot in August. As both The Huffington Post and NPR note, one explanation for Tuesday's conservative victories could be that Republican voters are more likely to vote in local and off-year elections. So if you're disappointed in Tuesday's election results, let that be a reminder to you to exercise your civic right in the next election — and encourage your friends to do the same.